It's that time again- Time for my Foodie Pen Pal Reveal! This month I was paired up with two readers. My Pen Pal was Shannon and she sent me package filled with awesome dairy free goodies. My first glimpse into my goodie box. I am not quite sure how she fit all of this into that small box! The first thing I did was read the very sweet card she included. My mom always taught me that whenever you get a gift, you always read the card first. :-) Shannon herself is not dairy free, but she was so sweet and made sure to read all the labels and make sure that everything in the box was. These chips were my favorite items. I am a huge chip fanatic- I'll take salty over sweet any day. The PopCorners Chips were so good! I have been wanting to try them for some time, but just never picked up a bag. They are easily my new favorite snack food! The Pita Chips were also very good- they tasted like the fried won-tons you get in Asian restaurants. I did share this bag with my husband since he loves pita chips. (I did not share very many of the PopCorners though). Quinoa is easily one of my favorite grains so I was thrilled to get a brand new box of it! It's still unopened but I have some plans for it once we get home from vacation. I always love to try a new tea, and Shannon sent me 3 to try. I had the Tazo Rest tea one evening after dinner when I was not feeling so great (allergy season has been tough on me this year). It tastes similar to Chamomile to me. It is a very relaxing tea- perfect before bed or if you have the sniffles. The Cold Brew tea is being packed for the beach so I can make myself a couple glasses of iced tea while we are there. The Yogi Perfect Energy tea I am saving for those afternoons when I need a pick me up. (I'm a bit of a food hoarder, I like to save and savor things like this). I had never had one of these bars before, and I tried it just the other day. It's a very sweet, nutty bar with a coconut flavor. I reminded me of eating a candy bar, but without the chocolate. Very sweet, and a great snack to have in my purse. I have been saving this specifically for vacation. I didn't want to open it before we left and have it go to waste, so I have wrapped it up and we are taking it with us. I love key lime, and so does my husband. I am thinking this will be perfect in the morning on a bagel or toast while we sit on the deck and sip our coffee. And I wanted to be sure to share it with our friends. So there you have it- this month's Foodie Pen Pal box. Thank you so much Shannon for all the wonderful goodies you sent! And for taking the time make sure each item was dairy free! 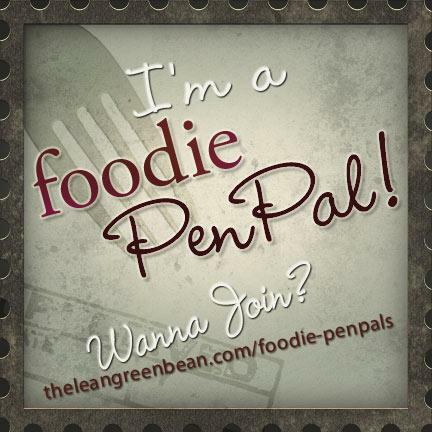 Are you interested in participating in the Foodie Pen Pals Program? Looks like it was a good one! I love popcorners- I wish they made the White Cheddar flavor in the big bag!